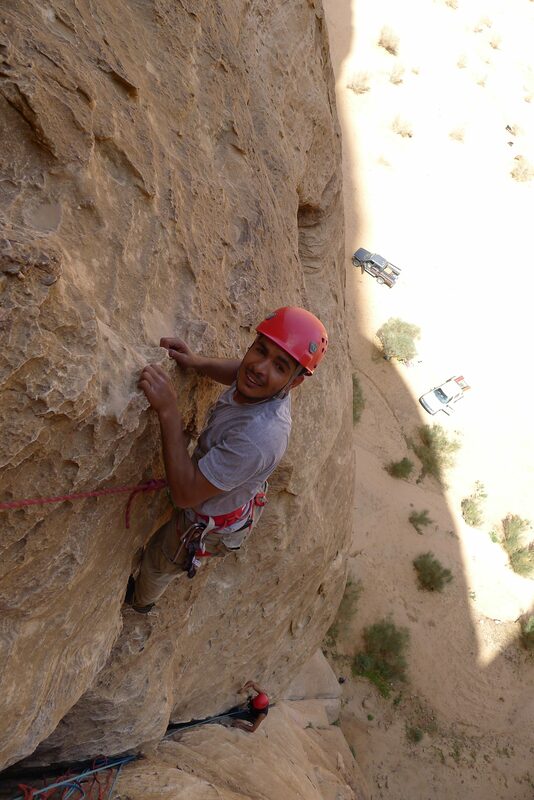 My first visit to Jordan was through a work trip for a project set up between the UIAA (International Climbing and Mountaineering Federation) and the Jordanian Tourism Board to run trekking and climbing leader courses to help create new, skilled job opportunities for the local Bedouin. This was to be the third series of courses of its type run in the country and the aim of them is to work on the successes that the UIAA’s mountain training scheme in Nepal has had. Accredited qualification streams set up to create safe working practices and build up the knowledge base and skills in country for the qualifications to become self-sufficient and no longer reliant on employing foreign instructors or guides. 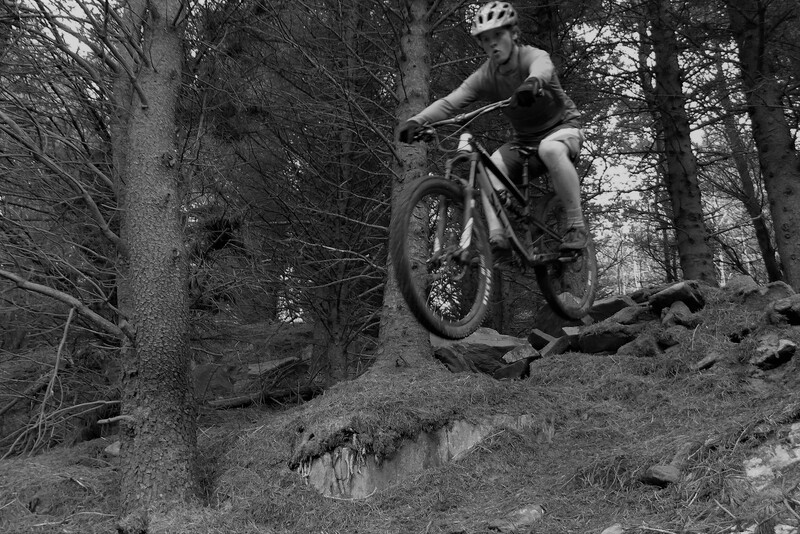 In the UK and much of Europe we have well developed and established qualification pathways that allow for skilled job opportunities in the outdoors as well as recognised ‘best practise’ which is not only of benefit to instructors, coaches and guides, but also to clients who will benefit from safer, more informative and more enjoyable days out. 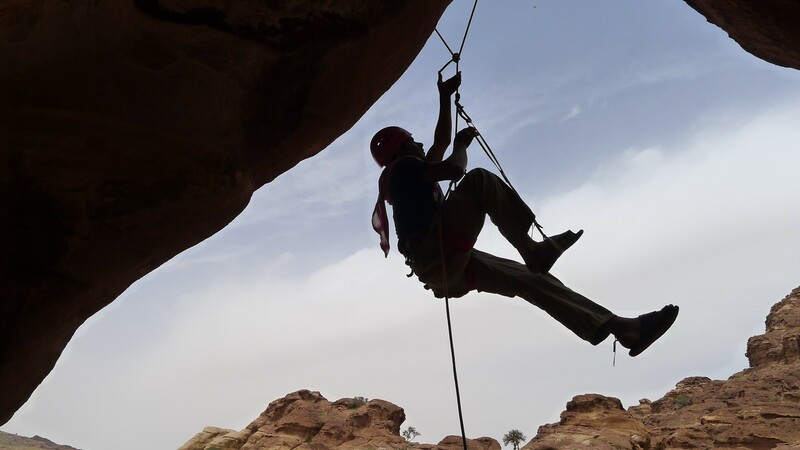 These are the skills we tried to impart with our friends in Jordan in the hope that some will come to enjoy working in the outdoors as much as we do. I was very fortunate to travel around Jordan with Khaled from the tourist board as well as the Bedouin we were working with and between the work we managed to visit the alien landscape of the Dead Sea and Wadi Mujib, the high mountain oasis of the Dana Biosphere, old crusader country surrounding Shobak castle, little Petra and its spectacular bigger brother of Petra, before finally arriving in the desert of Wadi Rum in the far south of the country. What struck me almost immediately whilst travelling was how kind and welcoming the people of Jordan are, we were constantly being invited to share the Bedouin staple of sweet tea’s and being told stories by proud locals of the often-fascinating histories of their home areas. 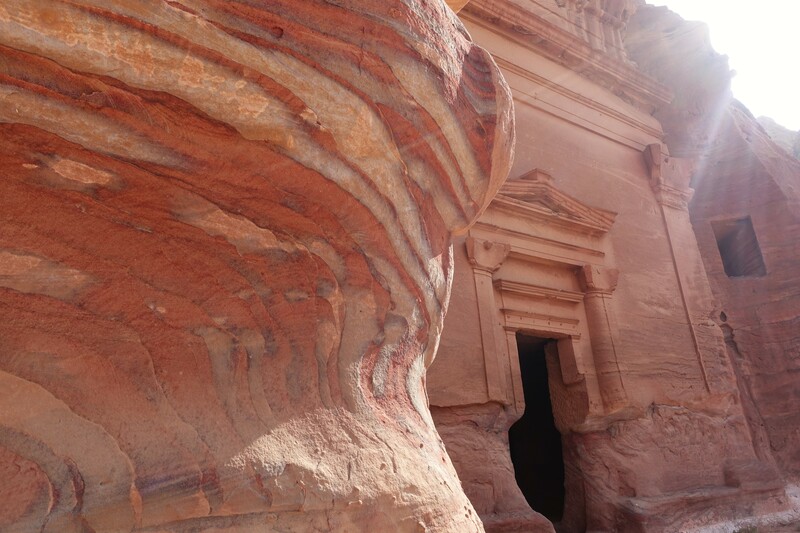 Jordan is a wonderfully diverse country with respect to its landscape, culture and history. It was refreshing to come to a country where attitudes towards refugees, forced to leave troubled homelands, were far more sympathetic and respectful than our comparatively trivial “illegal immigrant” problem our mainstream media keep complaining about. Jordan’s economy has taken a huge hit since the fall-out of 2011’s Arab Spring. The tourism industry, which has historically contributed 20% of GDP, has crashed by over 50% amid fears of terrorism in the Middle East. This unfortunate Western stereotype couldn’t be more misplaced in what I have come to think of as an extremely safe and welcoming country – the biggest danger you are likely to encounter is that of the regular unmarked traffic bumps! 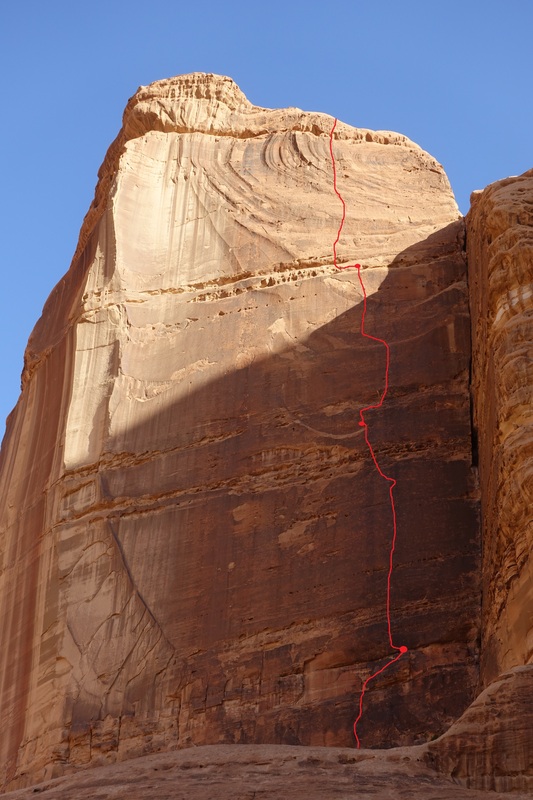 On the final day of the course we were running I guided the pair I was working with up the Wadi Rum classic ‘Merlin’s Wand’, one of the finest multi-pitch crack climbs in the world and a fitting climax to the week’s activities and learning. 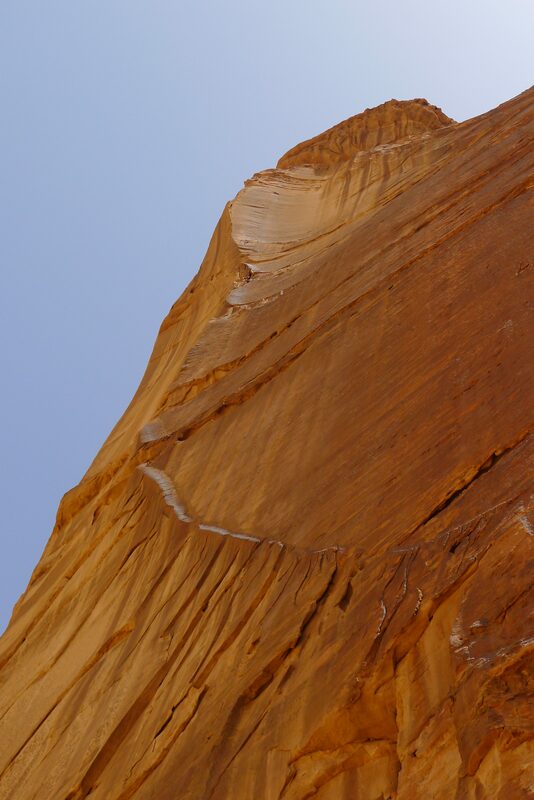 Whilst enjoying this spectacular route in Barrah Canyon my eye was drawn to a wall several hundred metres away to a stunning ramp and arête feature that looked barely climbable but one of the finest ‘lines’ I have ever seen. I had a wander over to its base, took a photograph and added the route to a long list of possible future projects – a sort of bucket list I have that never seems to diminish in size. On my return to the UK and thinking it would be difficult to convince anyone on a trip to go new routing in Jordan I was very surprised to find that Dan Mcmanus, after having a look at the project on my phone, was more enthusiastic to head out than myself and a plan was hatched to return in the slightly cooler weather of late November to avoid the summer heat of the desert. Arriving back in the desert eight months later we headed to Barrah Canyon immediately to try and discover just how possible our project would be. The obvious difficulty of the project as well as the complete lack of traditional protection meant that ground up new routing was realistically out of the window, especially considering that placing expansion bolts in this soft rock would be next to worthless and the only sustainable bolting solution was placing resin bolts. 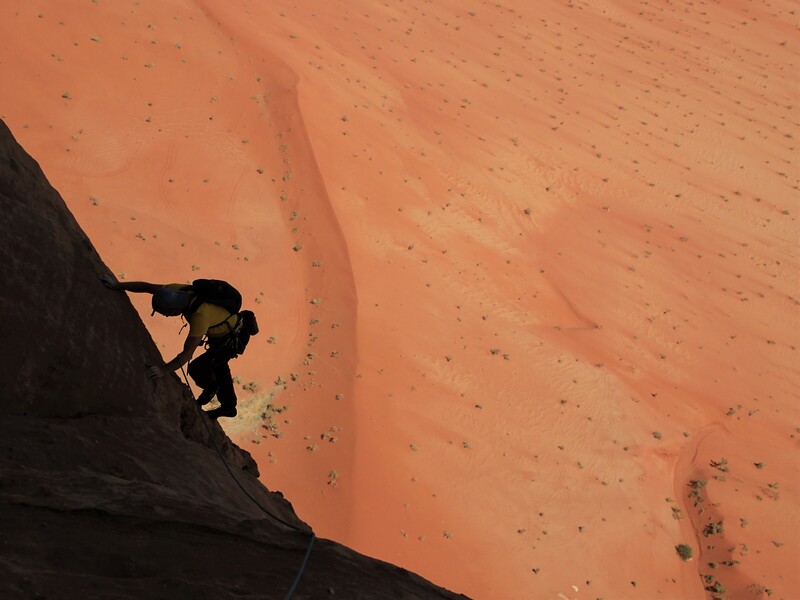 The climbing in Wadi Rum has historically been traditional climbing, where adventure is at the heart of the journey and this style and ethic has been nurtured and developed by pioneering climbers such as Tony Howard, author of the areas climbing guidebook. 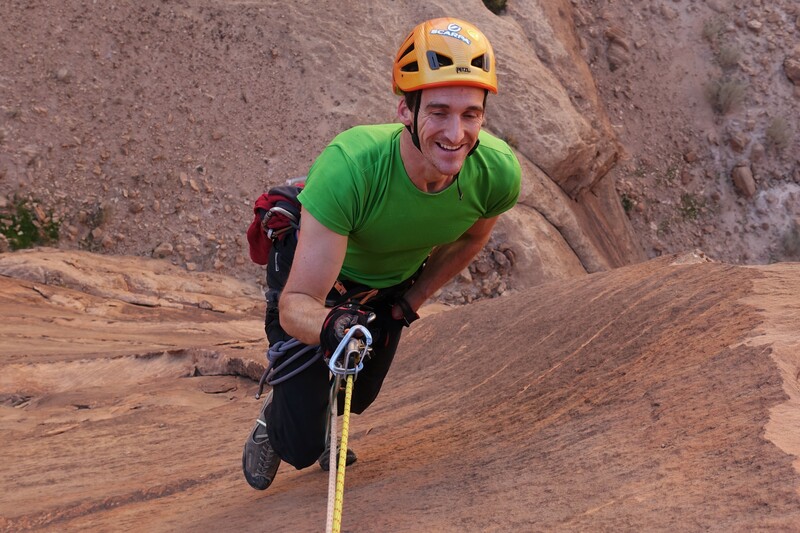 Many fine trad climbs exist in the area and there are still more to be developed, mostly outside of the honeypot areas. Whilst there are many fine climbs that can be traditionally protected, the majority of unclimbed rock faces in the area are featureless slabs, walls and overhangs where there is little, or no, traditional protection to be found. 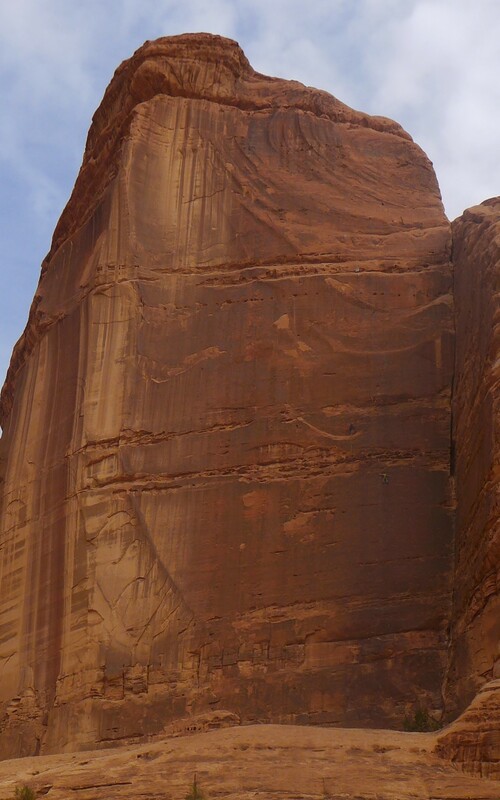 Some may argue that these faces are best left unclimbed if they cannot be protected by removable gear but I find that I will have to interject when people say they should be left for the future; I don’t believe there will ever be climbers capable, or perhaps more precisely willing, to solo fragile sandstone slabs and walls of a standard of 8a or above. 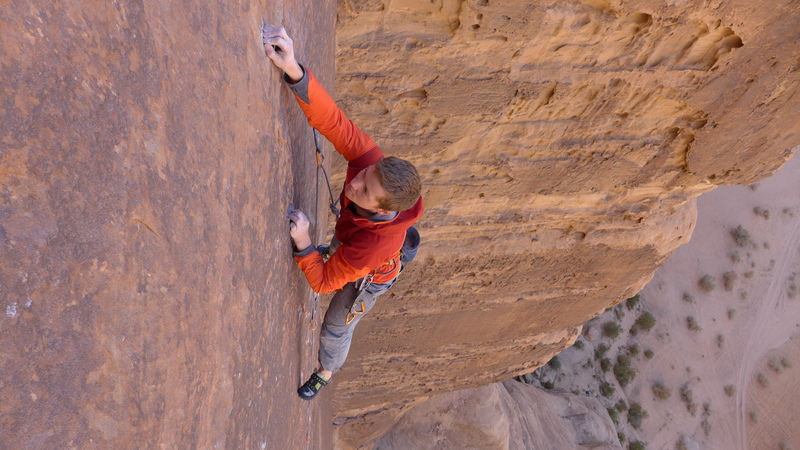 Not climbing these walls due to a ‘no bolts’ policy massively restricts the potential of future development in Wadi Rum and I believe a happy equilibrium can be continued, like it has these past 15 years, where sport routes and trad routes can exist in equal measure. 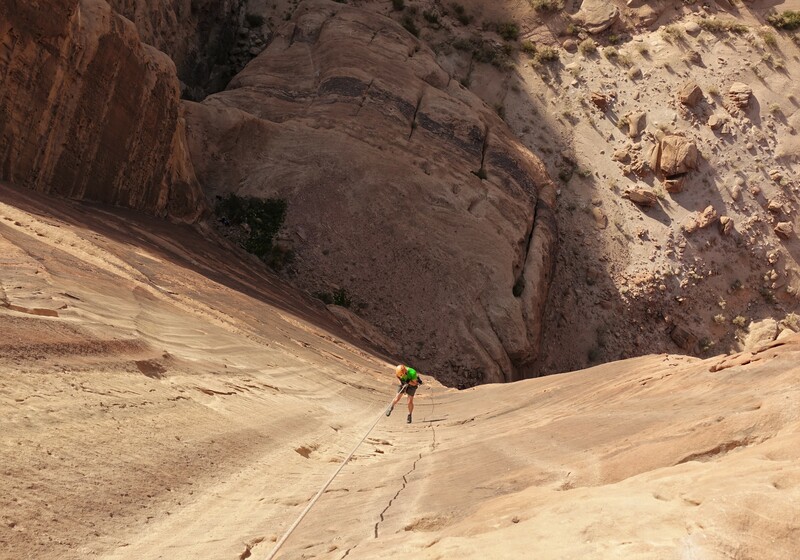 From what we found the locals gave little thought to the petty climbing ethics that as a wider community we share. In few other areas that I have visited has climbing felt like such a selfish and strange pursuit, where reflection and introspection left me with more questions than answers about what it is that I do. 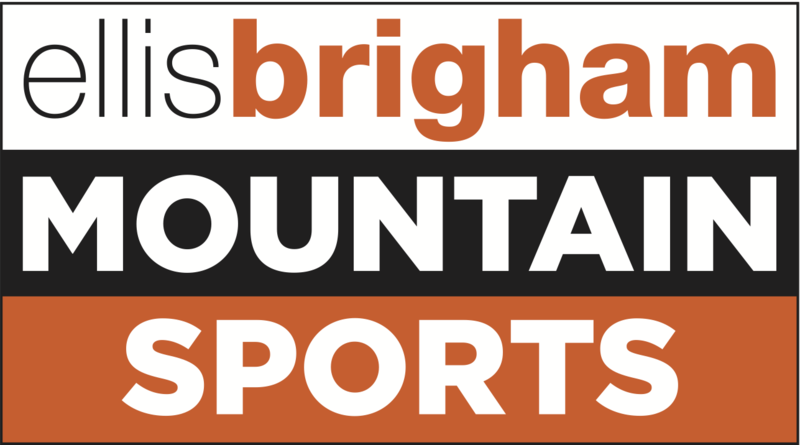 At the same time, that isn’t an excuse for a carte blanche to do whatever you want, ethics, albeit in such a unique activity as climbing, make us human and add immense value and meaning to the climbing community, one of a plethora of reasons that climbing is more of a lifelong activity than many other sporting pursuits. After scoping out the line from below we made a beeline for the top of the cliff via another route and spent our time abseiling down and working out just how possible it would be climb back up. The majority of the climbing looked feasible, albeit at a high technical standard, but we were somewhat dismayed to find that there were three very short sections of very thin climbing and although it may have been possible to climb by somebody, it certainly wasn’t for us. Our plan B was a bit of an afterthought, a quick inspection of the impressive but blank looking wall to the right to see if we could find any features up close. We were pleasantly surprised to find a ‘just’ possible line up the wall featuring extremely thin slab and wall climbing on excellent quality sandstone and immediately knew that we’d found our project. 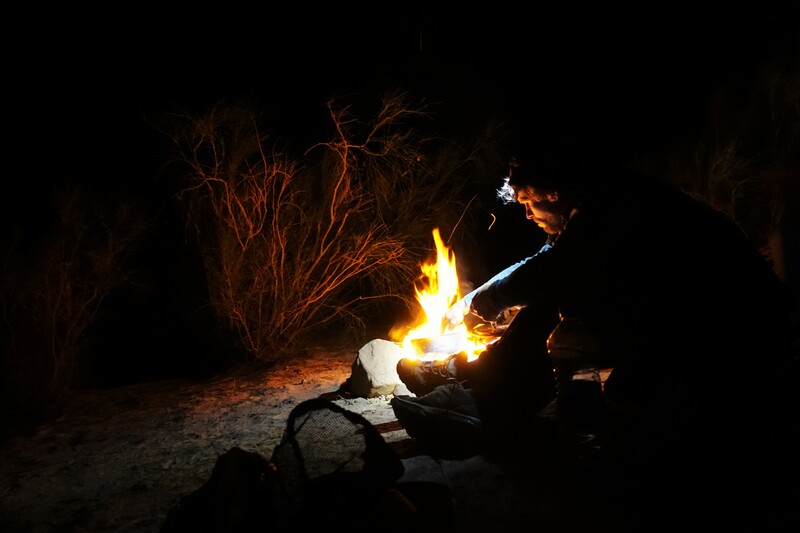 After a few days of touring the country with my wife Gabby and Dan’s girlfriend Kim we were back in the desert and re-energised for an attempt at the route. The first pitch is the shortest and easiest by far, but still a pleasant 7a+ warm up for the main events to come. I set off on the second pitch feeling reasonably confident but slightly nervous since it was the first time I’d been on the sharp end on anything harder than 6a for a couple of weeks. We anticipated this to be the crux pitch with around 50m of thin slab and wall climbing of around 8a in difficulty. I shook my way through the crux and, thinking I had the pitch in the bag, managed to fall off at the end of the longest run believing that my hopes were dashed for the day. After lowering back down Dan managed a smooth lead and I seconded the pitch cleanly to set us up for the next pitch. The final two pitches are about 45m and 55m in length with some hefty run outs between the bolts as we began to grow short of them. Although I’d had a quick play on the moves on both pitches I wasn’t very well prepared for leading them but thought I’d get cracking anyway. 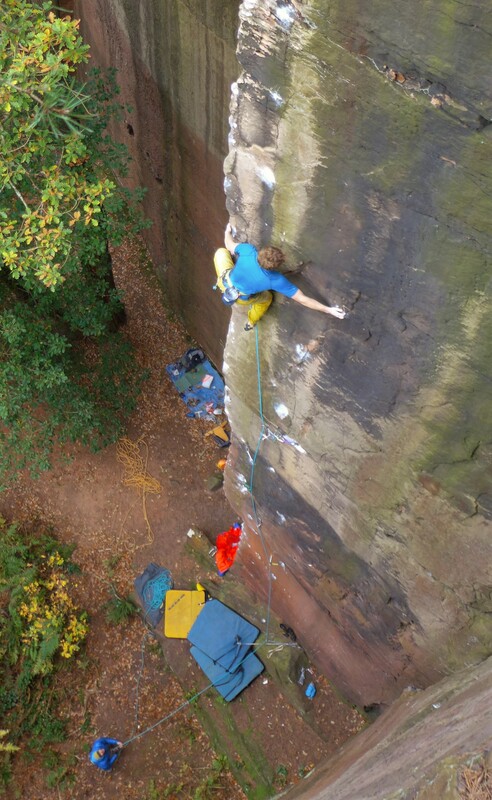 The third pitch is an immaculate wall climb with amazing ‘biscuit’ like flakes sticking out of the wall. Nearing the end of the pitch my forearms were really beginning to burn and I had to grunt my way up to the belay to what I thought was the end of all the hard climbing – how wrong was I to be. The final pitch has some of the longest run out sections on it but also seemed like it would be relatively easy on abseil so I told Dan that he should be able to scamper up it in no time. Unfortunately, my prediction couldn’t have been more wrong and the tricky climbing mixed in with the long run outs left Dan cursing me for sandbagging him. I ended up taking over the lead and was surprised to find this pitch a real sting in the tail at a bold 7b+, an excellent finale but not quite the finishing romp we’d anticipated! We’ve ended up calling the route ‘Yalla Shabab’, an Arabic phrase that was used repeatedly on the training courses I ran which translates roughly as ‘Let’s go!’ We hope others get the opportunity to enjoy the route just as much as we did in the future and would highly recommend the climbing of Wadi Rum to anybody who likes a bit of adventure, or indeed mixing up climbing and culture.